The PC Free Zone Gazette is American first and Conservative second. It is never anti-American! I am not sure if he did it intentionally to get attention or is as stupid as he looks. it does not matter.....he can go line up under a rocket landing for all I care since he is pro - Palestinian. ......Thank you RAC for sending this to me. Israel has every right to bomb Hamas heavy Gaza. Looks like that guy can't spell, either. Juice? Which juice? Orange, apple, pineapple, I know! Grapefruit juice! 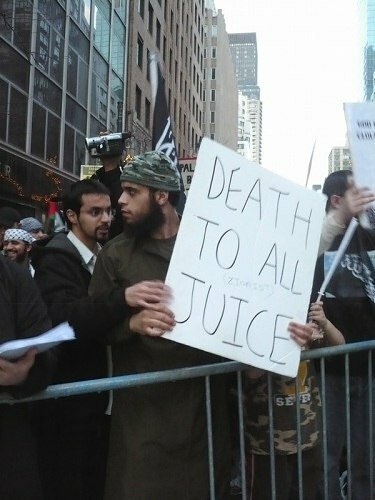 Juice, Jews, WTF ??? Nobody but nobody can accuse the Pally's of being intelligent!!! Hey, that's one of Obama's New York constituents. Bwahahahaha!!!! Well, hand me a sign. I had to think about it to figure out WTF he meant! Poll: 62% of Republicans support Gaza strikes — and just 31% of Democrats. Israel and others who seek peace and are fighting Islamofascist terrorists have a lot to fear from Barack Obama (Democrat) in the White House and a large majority Democrat run Congress. All the talk about diplomacy, truce, and cease-fire just shows that these "infidels" still haven't learned the art and tactics of Al-Takeyya (lying for Islam) and Hudna (deceitful cease-fire promises with the intent of breaking them when they are stronger). "Those who cannot learn from history are doomed to repeat it." Unfortunately, we are watching history repeat itself as Barack Obama with his Middle East foreign policy and advisors demonstrating that they are not part of the solution but a continuation of the problem. Lynn, LOL hahahaha Good one. Jack,LOL hahahaa yes, oh my gawd, to have a President that has friends like this and he does. Les, that should be 100% from both dem and rep. supporting Israel. I know it never will be like that. Thanks for the images and information Les. I appreciate it. You know, Nick might be on to something. OJ WAS the most hated person in America until Caylee Anthony, Blago and Carolyn Kennedy started getting so much press. This 'ISLAMO-LAMO-FASCIST' idiot is the GEICO Caveman II deal, eh? "Get rid of the JUICE?" Tammy Bruce had this on her web too. This idiot's father - Ayatollah Assahola - had a similar sign in Iran in 1979: "Death To The Great Santa!" Yeah, and we're the infidels? I was reading where the libs are accusing Israel of 'disproportionate and unfair response. They talk in simple terms like the Proportionality constant/ratio or as the Lib put it argument...i.e., if two Jews are killed Israel's response should be two palatinians are two be killed. Thankfully, this is not how the Israeli's operate. As Chrissie's sign says," The Israelis' believe in a disproportionate response". This is the only thing these Rag-heads understand. They use a stick we use a gun and so on. Better to be proactive than dead. Eden, haha yes. But I think it really is supposed to me Jews. Anyone that has that much hate is a very sick person, I just worry about this kind of hate existing in our country. Scary. Darth, thank you for telling about this. Tammy is great I love her blog too. Mark, ......"Better to be proactive than dead. "...I agree so much with what you said. lmao...never be afraid to fill me in...but I really did know he meant Jews after the initial mental lapse passed. You are viewing an individual archive page at The PC Freeze from Theodore's World. If Heaven Has a Gate, a Wall and Extreme Vetting, Why Can't America? President Donald Trump! Full Speech CPAC 2017! Actor, Robert Davi, Excellent Speech! CPAC 2017! Judge Jeanine Pirro! Sanctuary Cities! CPAC! Full Speech!